French: Grosbec errant; German: Abendkernbeißer; Spanish: Picogordo Vespertino. The evening grosbeak has a body length of about 7-8.7 in (18-22 cm) and weighs about 2.1 oz (60 g). It has a rather stout body, a short tail, and a stout yellow beak. The male is bright yellow, with black wings with a large white wing-patch, a black tail, and a black crown on the top of the head. Females are a duller gray and brown pattern, with white wing-patches. The evening grosbeak inhabits the southern boreal forest and montane forest regions of North America. The range includes Canada, the western United States, and northern Mexico. They may winter in the breeding range or wander extensively, particularly to the east and south of the breeding range. They periodically irrupt from the usual wintering areas and may then be abundant in areas where they are not commonly seen. 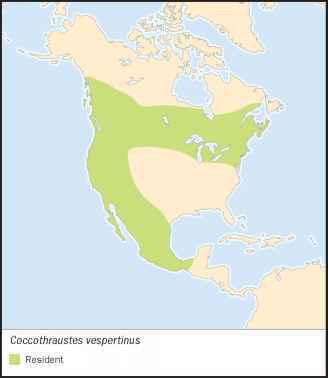 Evening grosbeaks breed in mixed conifer forest, but may winter in more open habitats. Evening grosbeaks are highly social birds, especially during the non-breeding season when they may occur in large flocks. The territorial song is a repeated chirp-like call. Evening grosbeaks feed mainly on tree seeds, but also frequent winter feeding sites to get sunflower seeds. Their diet also includes insects, buds, sap, fruits, and berries. Breeding pairs are monogamous and nest in colonies. 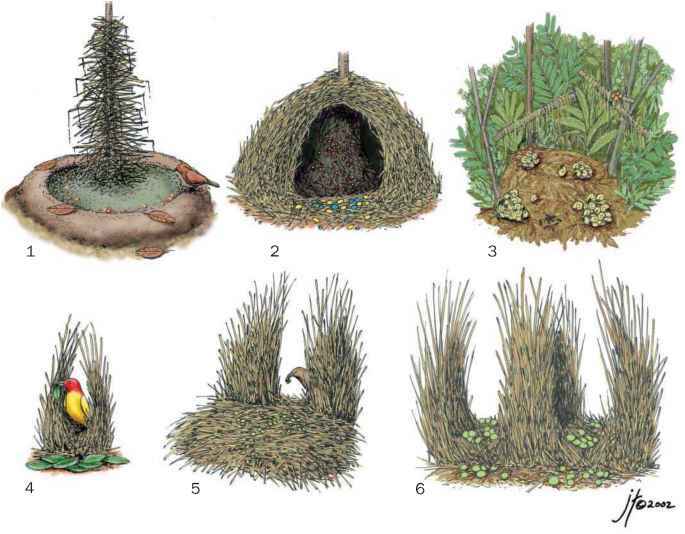 The female builds a frail, cup-shaped nest of twigs, grass, moss, roots, and pine needles on a horizontal tree branch far out from the trunk about 20-60 ft (6-18 m) above the ground. She incubates three to five pale blue to bluish eggs spotted with gray, purple, or brown for 11-14 days. The male feeds the incubating female. The altricial young are brooded by the female and fed by both sexes. They fledge in 13-14 days. One to two broods per year. Not threatened. The evening grosbeak is a widespread and abundant species and may be increasing in abundance and range.